Kris Anderson had the most liked content! 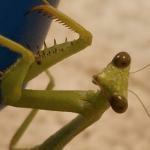 Currently writing comprehensive treatise: The Praying Mantises of the United States and Canada. ... compiling data, gathering samples, generating taxonomic illustrations.